Your Chamber is dedicated to serving the Brookfield business community, whether it be working with small business owners, supporting industries, or promoting tourism. The Chamber has a New Executive Director, Brookfield resident Susan Queenan. Our former Executive Director, Susan Murphy, stepped down from her position after 10 years in order to become the Membership Services Director. 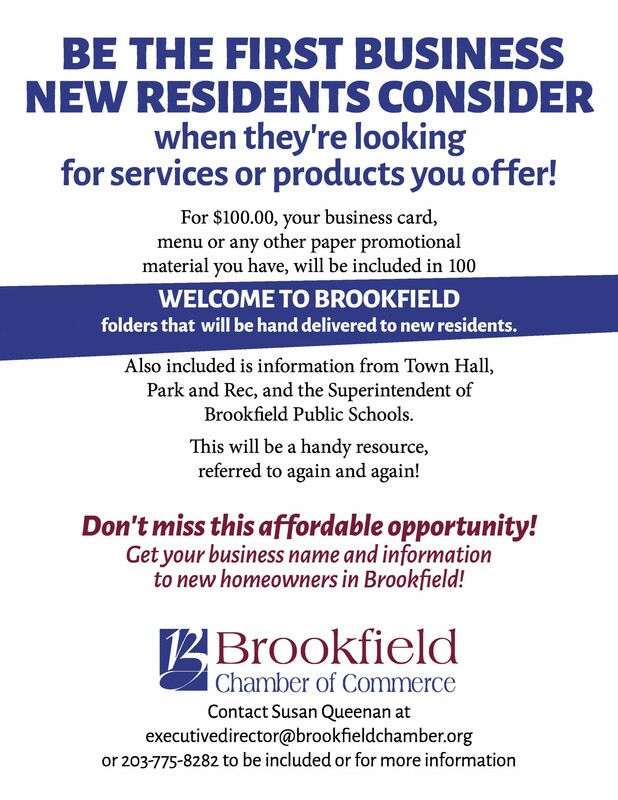 This is an exciting time for Brookfield Chamber of Commerce and business owners in Brookfield. As Brookfield Town Center continues to come to fruition and the opportunities it presents, we are happy to have Susan Queenan to help run the daily activities of the Chamber,” announced Rebecca Lollie. Stay tuned for more details. In the mean time, she can be reached at executivedirector@brookfieldchamber.org or at 203-775-8282. The Chamber has moved to just south of the Four Corners at 499 Federal Road, Unit 16, Brookfield. We are here for all your business and tourism needs.